Beverly Wong-Kleinjan is a bookbinder, artist, freelance writer, housewife and avid bookworm. She is also the owner of La Paperie & Cozy Handmade Journals. This shop specializes in handbound books which are made with medieval techniques! Her work pays homage to favourite authors and classic literary greats, incorporating many original journal styles, perfect for the enthusiastic literati. Beverly is giving away the above leather journal to a very lucky Haute Whimsy reader! I truly envy whoever gets randomly picked as the winner here :) This particular journal contains 320 pages of white unlined 28 lb./105 gsm writing paper with handtorn edges. The book opens flat so you can write or draw all the way into the margins. The binding is stitched with Irish linen bookbinding thread, visible on the spine. *Winner can choose to omit the opening quote page, which features an Abigail Adams quote, if they so choose. This giveaway is open to USA and Canada only. For a chance to win, please visit La Paperie & Cozy Handmade Journals and then leave a comment below letting us know what you would write in your journal! *Congratulations to our lucky winner, Kimberly! I would love to doodle and draw and have a place to collect some interesting & inspiring quotes! What an awesome giveaway! Feeling like a stalker... also following on Twitter. And I follow your blog in Google Reader. I love this! I would journal in this. I would count my blessings in a book like this! I can't believe I wasn't following her before! I loved getting to know you and hope you'll visit and follow my new blog. I would continue working on my novel in the journal! I follow your blog on nb and gfc! I follow La Paperie & Cozy Handmade Journals on GFC! I follow La Paperie & Cozy Handmade Journals on FB! If there were no lines I would use it as a sketching journal. And if there are lines I would use it to write in as a journal. I "like" La Paperie on Facebook. I also follow her on Twitter. She has been a favorite of mine on Etsy since forEVER. I would write love letters to my husband in this journal. I am @miladygreeneyes on Twitter and I posted about this contest. Twice, actually. I RT'd @la paperie yesterday and I linked to this post today. I would use it to write about my day, and what I'm thinking, except... I would write each entry like a letter to a friend that lives in Britain. I'm a writer so I keep a journal in my bag to write down random ideas and bits I think of. My current one is almost full, so this would be a great replacement! I would use it as a diary. I would jot down a little bit of what I did each day, make a few sketches, and keep a few quotes that I love. 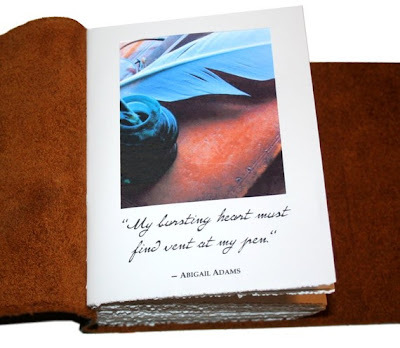 This journal would be a gift to a friend of mine who loves to write, he often writes poetry. I would write down my story ideas. I wouldn't write anything in the journal.... because I want to give this to my fiance as a Christmas gift. I would write quotes and draw doodlings in my journal! :)I love all the ones she offers in her shop! I like LaPaperie and Cozy on facebook! Katy A.
I would give it to my husband because he loves "real" journals. He is also dying to get a fountain pen to replace the one he lost. These would go together perfectly. In my book I would write stories to my children about life lessons I have learned, give them some good readings once I have passed on. With all the ways we put our thoughts into the wider world today, I would treasure the journal as a place to record my most personal thoughts. It's great to share, but it's even better to keep some things for yourself! I would love to put my favorite quotes in a journal like this, so lovely! I would write story ideas as well as my feelings about what happened to me each day! They are beautiful, I would write down things I want to remeber that my son says. I would love to doodle in my journal. My Mom doesn't live close by, so I would write a thank you letter to her for all the years she had to put up with me :) Then I would send it to her so she can keep a daily journal. Added to my favorites on ETSY! I'm an artist, so it would be an art journal for me. Follow La Paperie & Cozy Handmade Journals blog. Follow Haute Whimsy via Google Friend Connect. Favorite La Paperie & Cozy Handmade Journals on Etsy. I write three pages every morning in a book (at this time it is just a plain school book) it is about everything, anything, whatever crosses into my morning fog. It is a creativity exersize, this morning was day 73 of it! I would use this to write all the great quotes i find. I also like the love journal. These are absolutely beautiful! I would actually give it to my husband where he would store his favorite book excerpts and quotes. I follow @lapaperie on Twitter! Photography ideas, random thoughts, letters to my children, husband, farm animals. Everything. I would have my friends and family each design their own page. They could do whatever they wanted. Write a poem, draw a picture, fold the page origami style. I'd end up with a beautiful book with a personal touch! I LIKE Haute Whimsy on Facebook under: Baert Bournevoda. my hubby is really wanting a leather journal so this will be great if I win! I would write love letters to my wife. I would jot down my daily activities and thoughts. I'd use it as a gift. I'd write down quotes, poems, and probably the occasional doodle. My favourite item is the Leather Journal with Turquoise spike closure. Were I to win,I would likely give the journal to my sister. Though I enjoy writing, she truly as a gift for it, and would fill it wit her stories. Wow, these journals are just gorgeous! Thanks for the giveaway! My husband and I travel a lot, I would keep a record of the places we go, what we see, what we do, all the fun memories. It would be travel journal. This would be an ideal book to write about my new babies' first stages of development--sort of a "baby book" for my own enjoyment. I would use this journal as a diary to sort out my thoughts...it's been ages since I've sat and done this and I miss it a lot! I love the "Lady of Shalott" journal. All of them are beautiful! I would write and draw my design ideas. Follow La Paperie & Cozy Handmade Journals on Twitter @goldiez. Follow La Paperie & Cozy Handmade Journals blog as Diana. 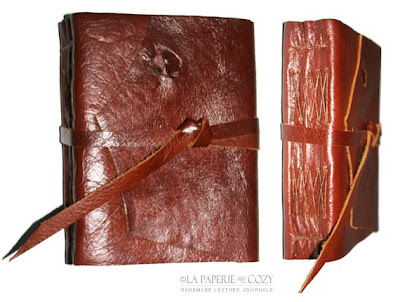 Favorited La Paperie & Cozy Handmade Journals on Etsy as goldiez. Follow Haute Whimsy via Google Friend Connect as Diana. Follow Haute Whimsy on Twitter @goldiez. "Like" Haute Whimsy on Facebook as Diana Z.
I would start writing my second book in this beautiful journal. It's such a stunning journal that it seems appropriate to use it for something very special. I would write about all the things I want to do, but never have the time to do. I would write notes on things I plan on making. La paperie is in my etsy favorites! I follow the la paperie blog! I'd write all the great ideas that I seem to only hold onto for a split second and then they're gone forever - ugh! I would write my inner thoughts and feelings! Hearted La Paperie on Etsy! I LIKE La Paperie & Cozy on Facebook! I LIKE Haute Whimsy on Facebook!